The Superintendent’s Annual Report is up with, inter alia, the 2016 dropout counts. 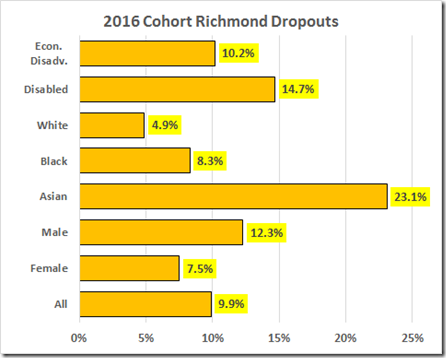 Here are the data for Richmond, expressed as percentages of the Fall enrollments. There is no entry for white males because of the suppression rules. The white male count could be as high as nine, which would give a rate of 0.80%. 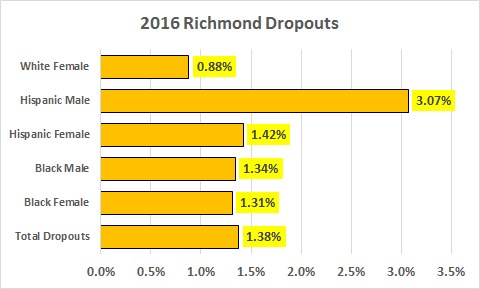 These are percentages of total enrollments, which in Richmond include the relatively larger elementary school numbers. 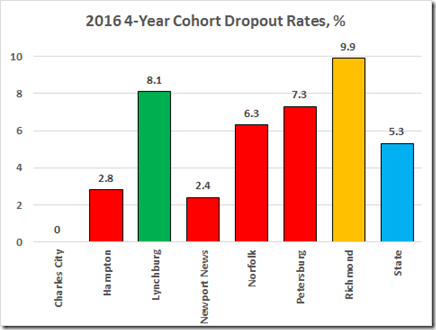 The more revealing data are the four-year cohort rates that show the dropouts as a percentage of the cohort entering high school four years earlier. Unfortunately, that report uses a different group classification, except for the total. As to the total, the cohort rate is 7.2 times the percentage of total enrollment. 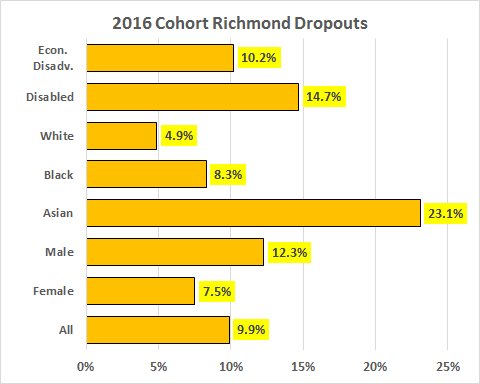 That 9.9% is 146 kids, out of the 1,472 student cohort, whom the Richmond Public Schools utterly failed to educate. 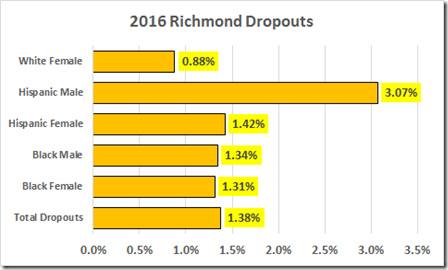 That Richmond rate is nearly double the state average and consistently larger than the rates in the peer cities; indeed, the Richmond rate is even larger (by 36%) than poor Petersburg.